Smak på några av Barcelonas bästa tapas under den här privata 3-timmarsturen. Besök 3 tapasbarer, var och en annorlunda, i närheten av Poble Sec, Raval och Eixample. Denna privata turné garanterar personlig uppmärksamhet från din privata guide. Hotellhämtning och avresa ingår. Träffa din privata guide utanför ditt hotell i Barcelona och ta sedan dig genom de omgivande stadsdelarna. Till fots eller via kollektivtrafik, kommer du att resa till grannskapen Poble Sec, Eixample och Raval, där några av stadens bästa tapas finns. 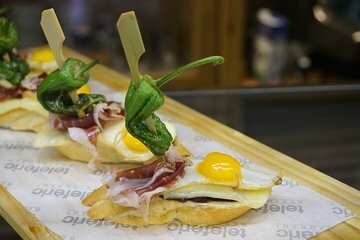 Besök 3 olika tapasbarer, prova allt från traditionella spanska tapas till pinchos från norra Spanien till lokala sorter. Nypa spanskt vin och lära dig om tapas traditionens kulinariska historia. Lär känna personligheten och stilen på varje bar och de tapas de tjänar. Denna privata turné garanterar personlig uppmärksamhet från din guide, en flexibel resväg och gott om möjligheter att ställa frågor. This was an excellent tour with a great guide Jordi. We were traveling with a 16 year old with food allergies and everything was handled great. 3 great Tapas restaurants that we would not have found on our own. Well worth the private tour, especially if traveling as a family. Tapas tour with Jordi is fun! It's like eating VIP. So knowledgeable even our questions is so pre historic. I love him! Nice tour but needed to be more lively! Our guide was nice, pleasant, and interested. However the tour itself was nothing we couldn't do on our own. There are so many tapas places I feel that we could have had the same experience without the tour. We had a lovely tour guide called Marc who actually took the trouble to send us a photograph of himself prior to the tour so that we would know who to expect to pick us up from the hotel. We were the only people on the tour so we really got to know him during the evening. He could tell us a lot about Tapas, how people use the bars etc and life in general in Barcelona. We highly recommend this tour. The 3 Tapas bars visited were very different to each other and all had delicious food. Our guide Albert was delightful and went to lengths to explain many aspects of Catalonian history and present day life and answered all our many questions. Albert fue un guía excepcional que nos llevó a comer a lugares típicos y de buena comida. Los disfrutamos mucho.